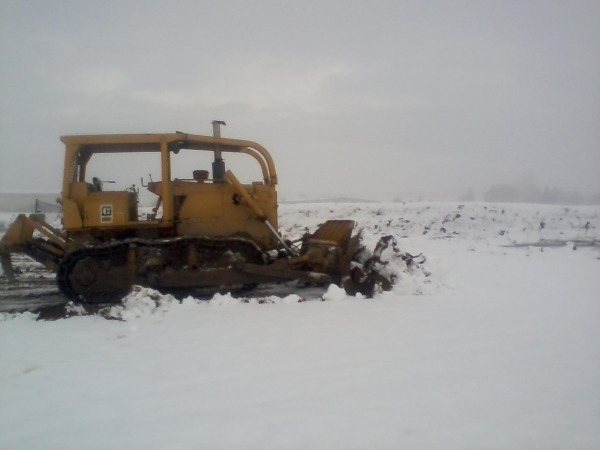 Description: I was plowing a little snow with our D6 today. If anybody needs their driveway plowed let me know. It's probably time for a new mailbox anyway . don't hit the mailbox sweet D6 wish I had one last summer to knock down trees on a buds place a country boy improvised used his big Versatile tractor & now blade to knock over the trees. That D6D would even take out one of Ag Hauler's concrete reinforced mail boxes. I was shoving 10'x10' by 2' thick concrete slabs out of the old foundation last week. It was soft wet clay ground and the old 6 just got tough and went to work. Our Case 130 excavator would barely move the slabs. 200 cubic feet of concrete weighs 10 tons if my slide rule is correct .